编者注: 印度邮友 Dr.Siraj 应本站之约,将为本站读者写一些介绍印度集邮情况的文章,这是他寄来的第二篇,希望对此有兴趣的邮友可以得到一些收获.原文是英文,本站作了简单的翻译.如果您有兴趣还可以点击这里浏览相应的英文网页 . 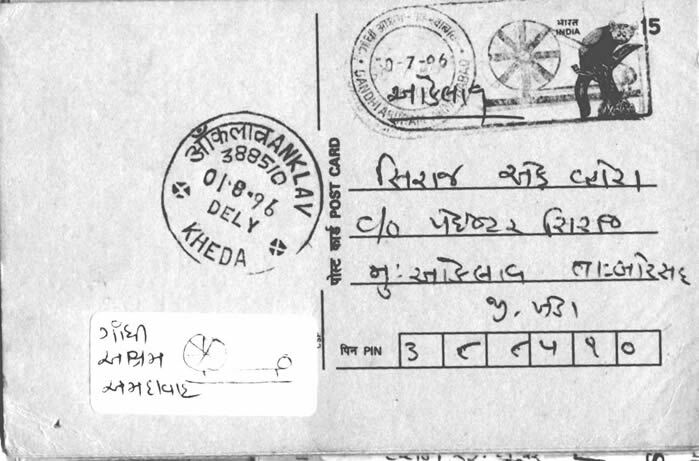 This cancellation mark is available for only those postal articles, which are posted at 'Gandhi ashram post office of Ahmedabad,'- A world famous place of Mahatma gandhi's memorial. from row cotton,which is finally used to prepare KHADI- A typical variety of cotton cloth. village level, in khadi making activity on chby itself in itself.